Hawaii Preparatory Academy’s Ka Makani Players present Patricia Joudry’s Teach Me How to Cry at 7 p.m. March 1-3 at the school’s Gates Performing Arts Center. Tickets, which only are available at the door, are $10 for adults and $5 for students. HPA theatre instructor Marina Tichotsky directs. Jared Terpak is technical director and junior Lauren Richards is makeup designer. “Teach Me How to Cry” is a coming of age story loosely based on the relationships in Romeo and Juliet. Melinda Grant, the daughter of a gentle, mildly demented seamstress, lives in a small town under the shadow of scandal. She yearns for a mother’s love and guidance, for young companionship, and for personal identity. She seeks this identity in the role of Juliet in a school production of Romeo and Juliet, where she meets William Henderson. William also lacks roots. His father is a traveling salesman and the constant moving, combined with family discord has made the boy insecure and sensitive to rejection. Though Melinda and William are separated by their parents, the vital steps to maturity have been taken and through their love for each other, they emerge as important people. 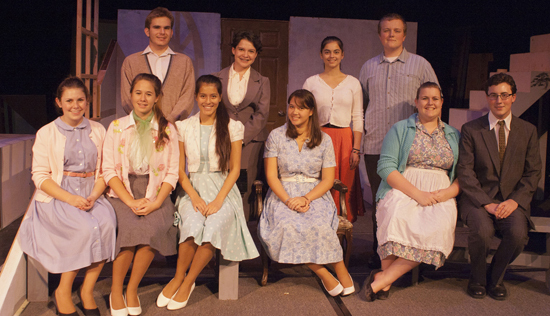 The cast features Linnea Gregg as Melinda, Delaney Ross as Mrs. Grant, Connor Bradley as William Henderson, Becca Barrett as Mrs. Henderson, and Justin Sandulli as Mr. Henderson. Angie Shumov is Polly, Allison Waldbeser is Anne, Eliana Kaplan is Eleanor, Matt Bowers is Bruce, and Harmony Graziano is Miss Robson. For further information, call 881-4099.